One of the things wine drinkers learn early on is that place matters. You can plant the same grape in two different places and get totally different wines. That sounds fairly obvious when you are talking about two different countries, say France and the United States. But what surprises most people is how wines produced from just a few miles apart can be so different. Rod Strong recognized that truth early on in his winemaking career. In 1965, he was the first to plant chardonnay in what would later be recognized as the Chalk Hill American Viticultural Area (AVA), established officially in 1983. He recognized the region as distinct from the rest of Russian River Valley for its unique, volcanically-derived, chalky white ash soils, which impart a subtle mineral character to wines grown there. 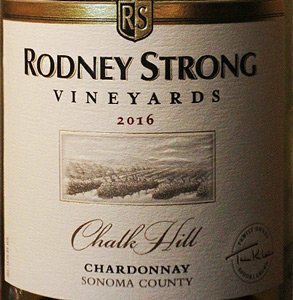 The Rodney Strong Chalk Hill Chardonnay ($21-23) is a beautiful expression of the grape, full of flavors of pear and Meyer lemon. It is a pretty pale gold in the glass with pleasant citrus aromas. The wine is creamy, but a crisp acidity lets it pair well with many foods. A hint of minerality shows up in a long, smooth finish. This is a vibrant, intense wine, with plenty of flavor packed in. It is drinking great now, but probably will last another 2-3 years if you want to cellar some. Barrel fermentation in new and used French oak barrels adds toasty vanilla and spice notes. The wine spent 12 months in the barrel, with regular stirring of the lees, giving the wine even more of a creamy texture. About three percent of the wine is aged in stainless steel with the rest in barrels. Although Strong sold the winery and has since died, the current owners continue to maintain his vision and have increased efforts at sustainability. In 2009 the winery became the first carbon neutral winery in Sonoma County. We also tried the Rodney Strong Russian River Valley pinot noir ($24-26), and it was wonderful, full of cherry and cranberry flavors and marked by a smooth, silky texture. This is a great bargain for a good pinot. Winery: California is full of wine makers and grape growers who started life doing something else before following a dream. Rodney Strong started out as a ballet dancer. The couple moved to Northern California, where they purchased a century-old boarding house and began making their first wines under the name Sonoma Vineyards. In the beginning, he purchased bulk wine and blended and bottled it to his taste in the cellar of the house, while Charlotte operated the tasting room on the ground floor. In 1962, Strong purchased a turn-of-the-century winery and vineyard in Windsor, Sonoma County with 159 acres of “mixed” grapes. He started asking questions and taking classes to learn the craft of winemaking. Then in 1965 he replanted his vineyards in chardonnay and led the charge to get Chalk Hill designated as an AVA. He bought land in the Russian River Valley after taking out a loan in 1968. His was one of the first vineyards in a place that was known for dairies and fruit orchards. Using climate data from UC Davis, Strong figured out where to plant, and today those vineyards are among the best Pinot Noir vineyards in the region. A winery building he built in 1970 now serves as a tasting room and lower cellar. 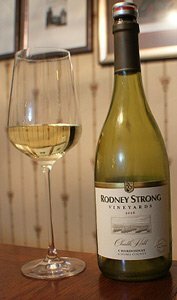 In 1980 the winery was renamed Rodney Strong Vineyards. Strong sold the winery, and later it was bought from the Guinness drinks empire by Tom Klein, a Stanford M.B.A. with familial roots in California agriculture. Strong continued to hang around the winery, serving as a sort of winemaker emeritus until his death in 2006. While sipping a glass of wine at a Sonoma winery one day Klein realized that he loved the wine industry and wanted to be a part of it. 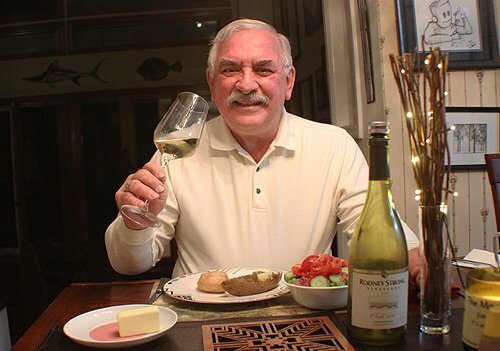 He convinced his family to buy Rodney Strong Vineyards in 1989. Both Tom and Rod realized that Rodney Strong Vineyards was a diamond in the rough, with the potential for great success. Over the next decade, the Klein family bought fermentation tanks, state-of-the-art presses and many other major capital items to allow the winery to grow and get better. The winery has won many awards, including being named Wine Enthusiast’s American Winery of the Year in 2013. Winemaker Rick Sayre and the Klein family continue their drive for innovation and devotion to Sonoma County, with 14 exceptional estate vineyards representing a range of varietal selection and regional terroir. The winery’s total production is about 830,000 cases, making it the 20th-largest U.S. wine company. Goes with: We had this outstanding wine with a meal cooked using one of the new kitchen toys we got for Christmas. I had heard a great deal about the sous vide (sue veed) method of cooking, but had never tried it until Teri’s sister and brother-in-law gave us one. I’m glad they did because the chicken dish we made using it turned out wonderfully. And it is incredibly easy to use. Chefs have been using this method for a long time to make sure the food comes out perfectly every time, but it is only recently that it has become available to home cooks. Basically, you’re cooking in hot water, with the food sealed in a plastic bag. The sous vide machine heats the water up to the temperature you want and tells you how long it should cook. For our chicken breasts it was 150 degrees for about an hour. The amazing thing is you can leave the food in the hot water for another hour or two without damaging it. So I took the boneless, skinless chicken breasts, seasoned them with some barbecue sauce, Morton Nature’s Seasons and some other herbs and sealed them in the bag. You clip the bag to the side of the pot, plug in the machine, access it through an app on your phone and put in the right settings and just walk away. An hour later the chicken was ready, and it was moist, tender and hot. We added baked potatoes, peas and a tossed salad to complete the feast. I think we will be thanking Mary Jo and Russ for many years to come as we have fun with sous vide. The Rodney Strong chardonnay was wonderful with the chicken. The creamy texture mixed nicely with the barbecue flavor. The pear flavor really came out in the wine during the meal. This versatile wine can be paired with a variety of dishes, from a gourmet cheese plate to a creamy vegetable pasta to grilled halibut.